Not long ago, we spent an amazing weekend in Monterrico, a small, beach town on the Pacific Coast of Guatemala. The town is a popular spot for locals and egg-laying sea turtles. There are at least two Tortugarios (turtle hatcheries), that are working to preserve and grow the population of sea turtles in the local waters. Each night from August to December workers and volunteers of the Tortugarios walk the beach looking for sea turtles that are digging a nest and laying eggs. As soon as the eggs are laid, and even while they're being laid, they are collected and brought to the Tortugario in order to protect them from predators. The eggs are reburied within the safety of the hatchery where they are tracked by calender. 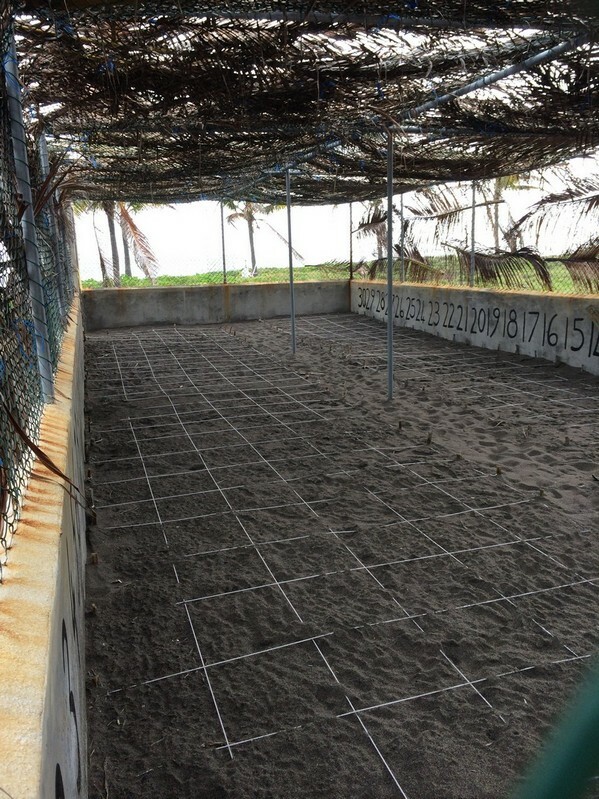 This grid system helps track when the turtles will hatch. About 60-70 days after being laid, the eggs hatch and the hatchlings dig their way to the surface. At nightfall, they instinctively crawl into the ocean. Obviously they can't get far when housed in a protective environment so the Tortugario collects the hatchlings and brings them to the beach for release. In order to protect the hatchlings on their short journey into the water the hatchery ropes off a small section of the beach. For a donation of Q10 ($1.30US), onlookers get the opportunity to personally release one of the turtles. Initially both kids and I were interested. Mickelle thought the experience was incredible, but recognized having to hold a squiggly, alien looking hatchling would only bring harm to the hatchling. Shortly after receiving our three hatchlings, Tag decided he was not going to touch one. Hmm...clearly that's Mick's genes. Elle, on the other hand, was thrilled. She LOVES turtles and couldn't get enough. 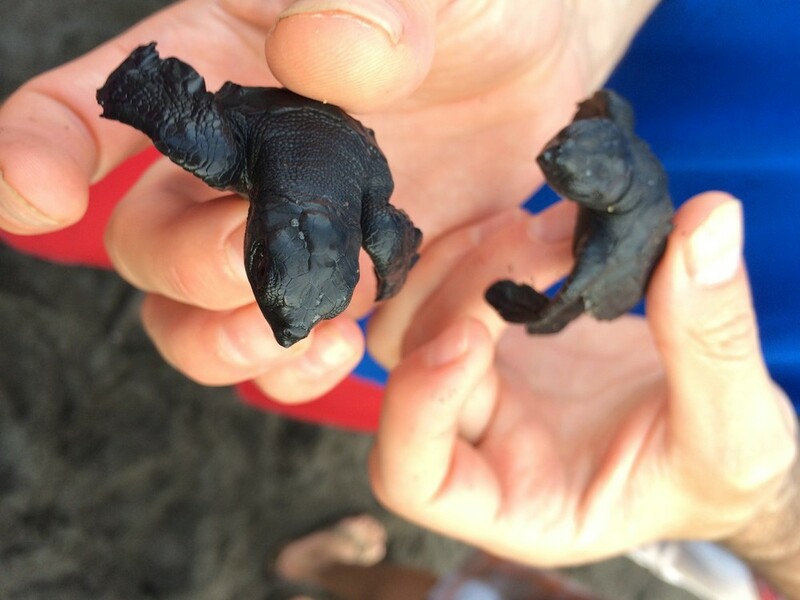 Elle and I holding newly hatched Leatherback Sea turtles. She was thrilled. They were very cute and active but Mickelle and Tag refused to touch them. Then it was release time. The hatchery had us all line up next to the rope and release them at the same time. The surf in Monterrico can be rough (especially if you are only 1-2 inches long). It was a wild ride for some turtles but they all made it into the water. Elle released all three of our turtles. Watching her release them warmed our hearts. It's truly rewarding to give our children experiences we know they'll treasure for years to come. Tag watched the release, but he had important tunnels that needed digging so he did not watch for long. Tag played in the sand and pretty much ignored the turtles. Thanks for reading! If you enjoyed this, does us a favor and click the Like or Share button below.